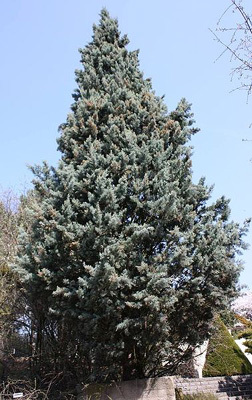 A native evergreen tree from central Arizona. Foliage green to blue gray. Bark is rough, exfoliating in flat sheets and leaving a beautiful, clearly red, smooth, polished underbark. Wood and foliage is very aromatic. Leaves are scalelike and glaucous. Seed cones are subglobose to broadly ellipsoid 1/2" to 1 1/2" long. It tolerates hot, dry conditions with ease and has a moderate to fast growth rate. 40' tall x 20' wide. Plant in mass for windbreak or screen. Variety "Blue Ice" is a spectacular color.